This page is here to give you a rough outlying of how your compression test results should be presented. What you need to know and what to ask for. Why can’t I use a piston tester? To start with we must point out that it is not possible to test a rotary engine (accurately) using a standard compression tester. This is due to the construction if the rotary engine, with 1 pair of spark plugs servicing 3 individual combustion chambers in the engine, a piston tester cannot read and old the individual compression figures. This is where a specialist rotary compression tester comes in. There are a range of testers available to specialists however what splits them apart from a piston tester is their ability to be able to log and interpret the individual compression figures from the rotary engine. As well at telling the operator the cranking speed of the engine during the test. Why do you need the cranking speed? The cranking speed in a rotary engine is extremely important when converting your results in to a meaningful set of results that can tell us how healthy your engine is. This is because in a rotary engine as your cranking speed goes up the ability for your engine to produce compression increases at a linea rate. Mazda rotary compression test results should be normalized to pressures produced at 250rpm. What should be my results look like. Well there are different ways that results can be presented. Depending on if your test has been done with a genuine Mazda tester or an alternate rotary tester. Each rotor should have 2 sets of results one for each chamber, in this example the figures in the “[680,830]” tell you the minimum and maximum pressures for a healthy engine. There is also figures for “Rotor Chamber Difference [<150]” this is the differential between the minimum and maximum pressures produced on each face of the respective rotor (in this case they could not exceed 150kPa difference to remain within acceptable spec. 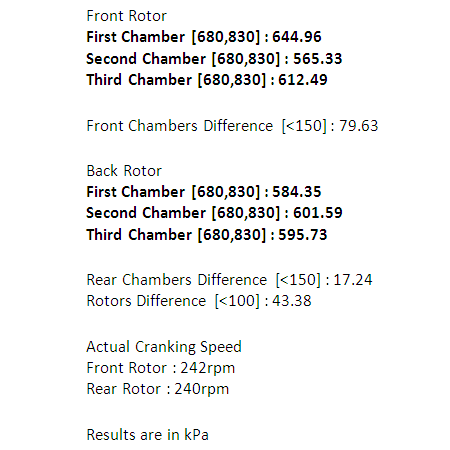 Similar to the above chamber difference but “Rotors Difference [<100]” tells you the difference between the highest and lowest figures across the two rotors. In this example they should not exceed 100kPa. Both rotor difference and chamber difference are not always included in compression results from other specialists. The basics you need to know when getting your results are. *varying units of measurement can be used it is normally kPa however others may use PSI, Kg f, BAR. **whilst the actual cranking speed is not essential information it can help when understanding what your engine is actually doing. However it is important that you have this figure if your results have not been normalized already.